It takes a long time for a lab science building to go from planning and fundraising, through permitting and construction and on to occupancy. 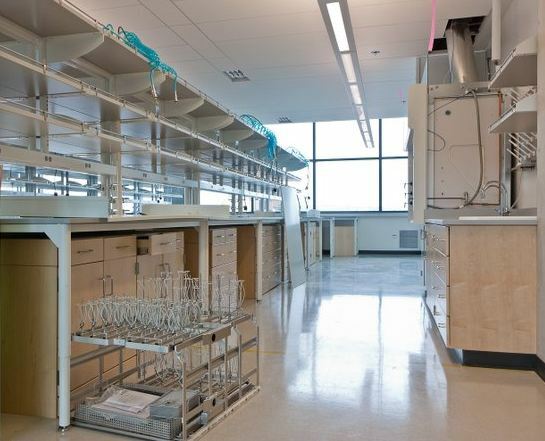 In the case of the University of Washington's Molecular Engineering and Sciences Building, which is celebrating its grand opening next week, that process took 5 years and had some unexpected perks. While there's been very little upside to the down economy since 2008, it has had the effect of lowering construction costs, which means that UW Seattle's newest science building is even bigger and better than they'd originally planned because they were able to get more for their $77M. “Scientists spend a lot of time in the lab. The UW faculty wanted to look at how we could make that a nicer place to be." UW officials are proud of the new building, not just because it is state-of-the-art, but also because it's "state-of-the-science." Molecular engineering is a relatively new field, and the UW Molecular Engineering and Sciences Institute (MOLES, the building's primary occupant) sees its mission as exploring a new kind of engineering for the 21st Century: rather than build bridges over rivers (still a noble feat), the new molecular engineer may be building proteins that travel to specific parts of the body. He or she may follow the latest developments in chemistry, biology, physics, nanotechnology and predictive modeling; and his or her research projects will often be interdisciplinary, with colleagues from diverse fields and perhaps different institutions. Research at the Institute for Molecular Engineering & Sciences will be evolvable and dynamic, focusing initially on the themes of CleanTech and BioTech. Crowdsourcing Research Challenge by UW Scientists a Game Changer? Biotechnology Calendar, Inc. is a full service event marketing and planning company producing on-campus, life science research tradeshows nationwide for the past 20 years. We plan and promote each event to bring the best products and services to the best research campuses across the country.